The Flute Festival registration begins at 8:30 am. The day will include a full recital, two-hour masterclass, and lecture with Soo-Kyung Park, Professor of Flute at New York University. A junior-high masterclass will be offered as well as the popular flute ensemble reading sessions. The lunchtime concert will feature local ensembles and there will be a flute choir concert featuring the Dana Flute Ensemble and other area flute choirs. Exhibitors from around the country (Volkwein’s, Flute Specialists, Royalton Music, Motter’s Music) will have booths offering flutes, music, and flute-related items for sale throughout the day. Whether you are a flutist of any age or perhaps just a flute-enthusiast, the 22nd Dana Flute Festival promises a fun day not to be missed! For more information, contact Dr. Kathryn Thomas Umble at the Dana School of Music: 330-941-1831 or email kaumble@ysu.edu. Please mail-in registration form below. Parking for a fee will be available in the Wick parking deck (M-1) directly south of Bliss Hall. The Dana Flute Festival is sponsored by Volkwein’s, the Friends of Music, the Dana School of Music, and Youngtown State University’s College of Creative Arts & Communication. For information call (330) 941-1831 or click Here. Flutist Soo-Kyung Park enjoys a multi-faceted career as a soloist, chamber musician, orchestral player, artistic director, writer and teacher. Upon arriving in United States in 1984, Ms. Park was accepted as the youngest flutist at The Juilliard School in the Pre-College Division, where she studied with Bonnie Lichter. She continued her studies at The Juilliard School where she earned both Bachelor’s and Master’s degrees in Music Performance under the tutelage of Julius Baker and Jeanne Baxtresser. Ms. Park first won international acclaim as winner of the Promising Artist Search in her native South Korea, where she performed in recital at the Seoul Arts Center, and subsequently won first prize in the New York Flute Club Competition, performing in New York’s Cami Hall. She has performed as soloist with the Korean Symphony at Alice Tully Hall. Her radio credits include APR’s “Performance Today” and WQXR’s “McGraw Hill Young Artist Showcase” hosted by Bob Sherman, where she was featured performing Mozart’s Flute Concerto. She has performed solo and chamber music concerts in the United States, and throughout Europe and Asia. As an orchestral musician, she has performed and toured as principal flute and piccolo with orchestras in the United States, Israel and Asia, with some of the world’s most eminent conductors, including Pierre Boulez, James DePreist, Jahja Ling, Kurt Masur, Byung Hyun Rhee, Leonard Slatkin, Gerard Schwarz and Hugh Wolff. Orchestras she has performed with include the Juilliard Orchestra, Knoxville Symphony Orchestra, New Jersey Symphony Orchestra, Spoleto Festival Orchestra, Prometheus Chamber Orchestra and Shira Festival Orchestra of Israel. Highly in demand as a teacher and coach, Ms. Park has taught master classes in the United States, Germany and Korea. In addition to her position on the faculty of New York University, she remains a faculty member of the Manhattan School of Music, Pre-College Division. In addition to maintaining an active flute studio, she is founder and president of an educational consulting company specializing in preparing American and International students for conservatory auditions and National/International competitions. Kathryn Thomas Umble, Festival Coordinator, is Associate Professor of Flute at Youngstown State University and has served on the faculties of Bowling Green State University and Grove City College. Dr. Umble holds degrees from the University of Michigan, Bowling Green State University, and Michigan State University and was awarded the Prix d'excellence for Outstanding Musicianship from the Fontainebleau School of Music, France, which she attended on full scholarship. 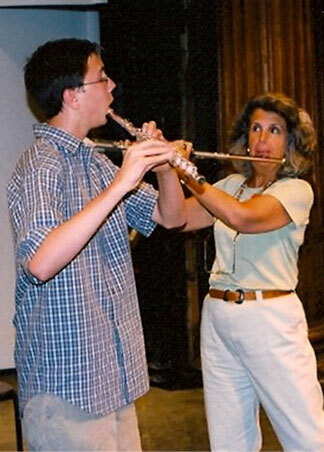 Dr. Umble has also served as a National Flute Association competition judge and flute pedagogy panel member. She conducted the Dana Flute Ensemble in a full concert performance at the 2005 OMEA Conference and the 2006 and 2009 National Flute Association Conventions. 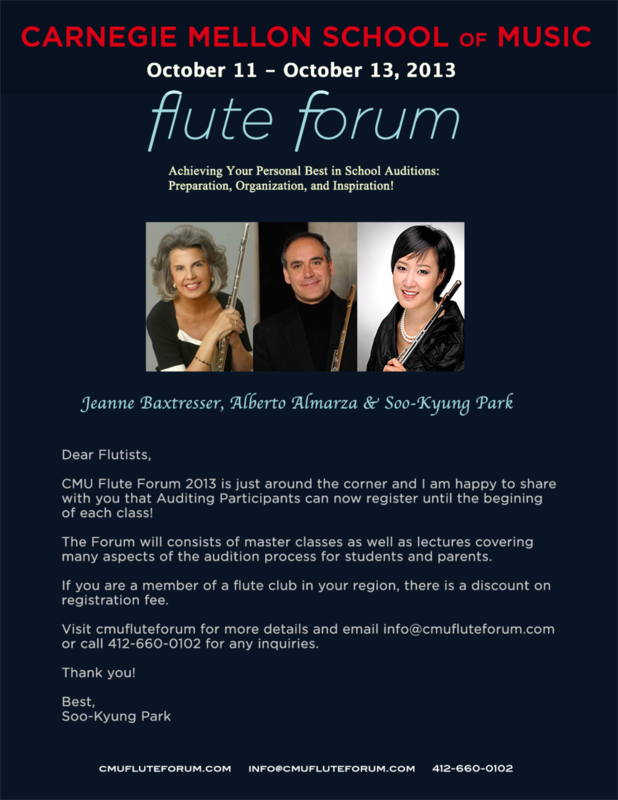 Join World Renowned Faculty JEANNE BAXTRESSER & ALBERTO ALMARZA with guest artist SOO-KYUNG PARK at the FLUTE FORUM — masterclasses for the advanced flutist. Jeanne Baxtresser has held principal positions with three major orchestras, culminating in her 15-year tenure as Solo Flutist of the New York Philharmonic. Making her heralded debut with the Minnesota Orchestra at age 14, Ms. Baxtresser began her professional career as Principal Flutist of the Montreal Symphony immediately following her graduation from The Juilliard School, where she studied with Julius Baker. She was subsequently appointed Principal Flute of the Toronto Symphony before being invited by Music Director Zubin Mehta to join the New York Philharmonic. Ms. Baxtresser appeared as soloist with the New York Philharmonic on more than fifty occasions, and has been featured as a soloist across North America and Europe. Ms. Baxtresser was named a recipient of the National Flute Association’s Lifetime Achievement Award for significant, lasting contributions to the flute world, and she was also awarded the National Medal of Arts from the Interlochen Center for the Arts. She is recognized internationally as a leading recording artist, author and lecturer. In great demand as a teacher, many of Ms. Baxtresser’s students occupy principal and section positions in major orchestras throughout the United States, Canada, Europe, and Asia. While in New York, Ms. Baxtresser served on the faculties of The Juilliard School and the Manhattan School of Music. In 1998, she was appointed the Vira I. Heinz Professor of Flute at Carnegie Mellon University in Pittsburgh, where she has attracted many outstanding flute students from around the world. Ms. Baxtresser was also named University Professor, Carnegie Mellon University’s most distinguished professorial position awarded to those individuals who have achieved exceptional international recognition. Ms. Baxtresser’s exceptional career as a recitalist, concerto soloist and chamber musician has produced numerous recordings, including New York Legends—Jeanne Baxtresser (Cala), Jeanne Baxtresser—A Collection of My Favorites (MSR Classics), and Chamber Music for Flute (Cala), featuring her performances with principal players of the New York Philharmonic. She has recorded many of the major symphonic works with the New York Philharmonic under Leonard Bernstein, Zubin Mehta and Kurt Masur. Ms. Baxtresser’s acclaimed first book, Orchestral Excerpts for Flute with Piano Accompaniment (Theodore Presser), has been re-released in a new revised edition. This book and a companion CD, Orchestral Excerpts for Flute with Spoken Commentary (Summit), have become a vital part of flute pedagogy. Her subsequent book, Great Flute Duos from the Orchestral Repertoire, was named the 2004 winner of the National Flute Association’s Newly Published Music Competition. Flutist Soo-Kyung Park enjoys a multi-faceted career as a soloist, chamber musician, orchestral player, artistic director, writer and teacher. Upon arriving in United States in 1984, Ms. Park was accepted at The Juilliard School in the Pre-College Division, where she studied with Bonnie Lichter. She continued her studies at The Juilliard School where she earned both Bachelor’s and Master’s degrees in Music Performance under the tutelage of Julius Baker and Jeanne Baxtresser. Ms. Park first won international acclaim as winner of the Promising Artist Search in her native South Korea, where she performed in recital at the Seoul Arts Center, and subsequently won first prize in the New York Flute Club Competition, performing in New York’s Cami Hall. She has performed as soloist with the Korean Symphony at Alice Tully Hall. Her radio credits include APR’s “Performance Today” and WQXR’s “McGraw Hill Young Artist Showcase” hosted by Bob Sherman, where she was featured performing Mozart’s Flute Concerto. She has performed solo and chamber music concerts in the United States, and throughout Europe and Asia. In addition to maintaining an active flute studio, she is founder and president of an educational consulting company specializing in preparing American and International students for conservatory auditions and National/International competitions. She also has produced numerous master classes featuring world renowned flutists, including Jeanne Baxtresser, Linda Chesis, Jasmine Choi, Bart Feller, Marya Martin, Judith Mendenhall, Michael Parloff, Karl-Heinz Schutz, Keith Underwood and Carol Wincenc. As the founding member and artistic director of the Musicians of Lenox Hill, she has led the ensemble for annual performances at the Temple of Israel in NYC for over a decade. Ms. Park has written for “Flute and Flutist” magazine in Korea, where her contributions include featured cover story interviews with Jeanne Baxtresser and Carol Wincenc. Her articles have also appeared in the Juilliard Journal. A Day in the Life of Woodwind and Brass students at NYU Steinhardt. Ever wonder what college will be like as a music student? Well, on Sunday, October 5, you and your parents can find out! Your event-filled day will include samplings of typical music-based classes, including: program meeting, theory, lessons, chamber music, New Music Ensemble, Orchestral Repertoire, and even musicians’ wellness. You will have lunch at a dorm and visit some of NYU’s most famous concert venues. You will have the opportunity to meet and greet both faculty and students, in addition to participating in amazing performances and lectures during an exciting, fun, and informative day at NYU Steinhardt Music and Performing Arts Professions. This is your chance to be an NYU student for a day. It all happens at 35 West 4th Street and it’s free of charge! Register in advance, or on the day of the event beginning at 10:30 am in the lobby of 35 West 4th Street. Flute, Oboe, Clarinet, Saxophone, Bassoon, Trumpet, Trombone, Horn and Tuba - This day is for you! All ages welcome. "Performance and Stage Presentation on Solo Repertoires"
1. Specail performance and lecture will be given by Sooyun Kim prior to the class at 5:15pm. 2. The most essential tips of stage presence will be discussed. 3. Parcipating performers and auditors are invited to a light refreshment reception. Praised as “A rare virtuoso of the Flute” by Libération, flutist Sooyun Kim has established herself as one of the rare flute soloists in the classical music scene. Since her concerto debut with the Seoul Philharmonic Orchestra at age ten, she has enjoyed a flourishing career performing with orchestras around the world including the Bavarian Radio, Munich Radio, Munich Chamber and Boston Pops Orchestras. She has concertized in Budapest, Paris, Munich, Kobe, and Seoul; and at the Gardner Museum, Kennedy Center, and Carnegie, Alice Tully, and Jordan halls. Last season, she gave her European debut recital at the Auditorium du Louvre which resulted in immediate engagements for additional recitals in Germany, Finland, Denmark and Sweden. In summer of 2012, she served as an Artist in Residence with the Danish Chamber Players in Denmark where she curated and collaborated with the ensemble in their annual festival “Summermusic in Fuglsang”. Ms. Kim has received numerous international awards and prizes including the third prize at the Munich ARD International Flute Competition and the Georg Solti Foundation Career Grant. She studied at the New England Conservatory under the tutelage of Paula Robison. In addition to her musical training, she studied baroque dance with Melinda Sullivan. Ms. Kim is an Artist Member of the Chamber Music Society of Lincoln Center. Would you like to subscribe SKP Musicians? Sign up with your email address to receive lastest news and updates. The Flute Forum with Jeanne Baxtresser and Alberto Almarza. Join us for The Consummate Flutist, an inspirational week of masterclasses, lectures and workshops with master artists Jeanne Baxtresser, Alberto Almarza, Jim Walker and Soo-Kyung Park. Daily masterclasses will focus on standard repertoire and orchestral excerpts. In addition, the flute faculty will present lectures and workshops focusing on many aspects of flute performance and career planning, including performance and audition techniques, Baroque and extended technique classes, and strategies for being a successful student and beyond! ADVANCED HIGH SCHOOL, COLLEGE and PRE-PROFESSIONAL students wishing to be participants at The Consummate Flutist will receive a private mini-session (15 minutes) with Alberto Almarza or Soo-Kyung Park and are invited to a special Participant Forum/Discussion with Alberto Almarza and Jeanne Baxtresser. In addition, participants will have access to all masterclasses, workshops and lectures. No audition is required, however space is limited. Students wishing to be participants are asked for a CURRENT BIOGRAPHY with their registration (250 word max). Auditors of ANY AGE are welcome to attend any of the masterclasses, workshops and lectures. Daily passes are available for Thursday, Friday and Saturday. Half-Day Passes are available for Wednesday and Sunday. Teachers and parents of REGISTERED performers & participants are welcome to attend The Consummate Flutist as our guests, at no charge. Students must register their parents/teacher on their registration form. This recording can be with or without piano and should give a complete picture of the technical and lyrical playing abilities of the performer. Once accepted, performers can accept their position and register at any time before May 1. Discounted registration rates are offered to those that register and pay early. Late applications will only be accepted if space is available. OFF-CAMPUS: For students under 18, those traveling with teachers or families and anyone wishing to stay off-campus, we have made arrangements with three local hotels. These hotels will offer a special discount to those attending The Consummate Flutist and offer shuttle service to Carnegie Mellon University. Hotel details (with discount codes) will be available soon. Meals are not included. A variety of eateries are available on Carnegie Mellon’s campus, as well as restaurants in Oakland, Shadyside and Squirrel Hill. May 18th – Housing Payment DUE for those requesting on-campus housing. See registration form for details. May 31 – LATE registration online ($60 registration fee) For participants and performers, if space is available. The New York Flute Club is pleased to announce our second Flute Composition Competition for the 2014-15 season. The first competition, held in 1948, was won by Eldin Burton for his Sonatina, which is now part of our standard repertoire. We are seeking to encourage compositions for flute and to bring exciting new compositions to the entire flute community. The Musicians of Lenox Hill, Cyrus Beroukhim, violin, Timothy Cobb, double bass, Emilie-Anne Gendron, violin, Min Kwon, piano, Wei-Yang Andy Lin, viola, Alberto Parrini, cello, and Soo-Kyung Park, flute and artistic director, have each won international acclaim performing with major orchestras and ensembles and winning many of the world's most prestigious music competitions. &nbsp;This is the ensemble’s fifteenth annual concert at Temple Israel, fulfilling the vision of the late Muriel Levy to continue the music she and her husband loved. This year’s concert brings these extraordinary musicians together to perform chamber music written by some of the world’s greatest composers. In this multifaceted weekend class, flutists will receive valuable insight through lectures and master classes to ready them for the challenging process of applying to undergraduate and graduate music programs. Faculty lectures will cover the many aspects of the audition process, including the application procedure, choosing repertoire, making a CD/DVD, audition presentation, effective practice and learning to enjoy the entire process. Daily master classes will in turn be dedicated to the musical and technical aspects of the audition. The Carnegie Mellon Flute Forum is also designed to provide valuable resources and insight to flute teachers as they train their students to prepare and practice successfully. And, as the year of auditioning for music schools is ideally a collaborative family experience, we are inviting and encouraging parents to attend, without a fee. Students leaving the class will be inspired, energized and ready to enter the audition experience with confidence and enthusiasm! "Drawing Your Own Map for Your Musical Journey This School Year"
Make this school year a step closer to your musical goal. 20 seats will be reserved on a first come, first served basis.